This video, recorded late on Thursday afternoon, is going viral around the world. No wonder, because it's a rare chance to see just how much needs to be taken into account when creating a structure like stadium roof. 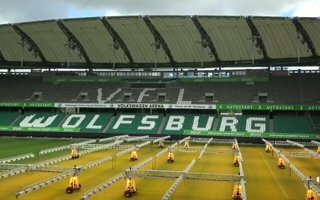 The lightweight PVC dome hovering 33 meters above the field of Volkswagen Arena was tested by storm Xavier, which saw peak wind speed in the exact region of Wolfsburg (178km/h or 122mph just 70 km away from the city). And still, the tensile cable structure was left untouched, despite having literally danced with the blowing wind. As VfL Wolfsburg assured their fans, the roof can withstand winds much stronger than those during Xavier. Puh, da war ganz schön was los heute in Wolfsburg. Dieses Video aus der Volkswagen Arena zeigt die Kraft des Windes ziemlich Eindrucksvoll. Habt ihr auch Fotos oder Videos vom Sturm und den Schäden gemacht? The membrane structure topping Volkswagen Arena consists of 32 radial trusses arranged at intervals of up to 14 meters with an individual length of up to 40 meters. The individual membrane fields of the membrane structure shows dimensions of up to 14x36 meters, which are mounted between these radial trusses and are stabilized against snow and wind. 20,000 sqm of membrane material for the membrane structure was required to cover the seating area below.